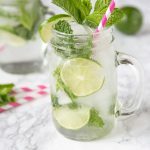 Skinny Mojito – enjoy all the flavors of a classic mint mojito, in an easy and just a little bit healthier version. Happy Friday! 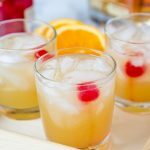 I think making it to Friday deserves a cocktail. We had a full week of waking up at 6:30 for school, and I am exhausted. I think we all will be asleep early tonight, and hopefully sleep in tomorrow. I am still trying to figure out my workout schedule with this new early morning wake up. I am just not a morning person, and have a hard time getting up at 6 to actually do something. I am jealous of those of you that can do it! 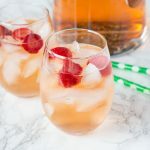 To feel a little less guilty about a missed workout, I think skinny cocktails are in order! I am pretty sure mojito recipe purists will rake me over the coals for this recipe. 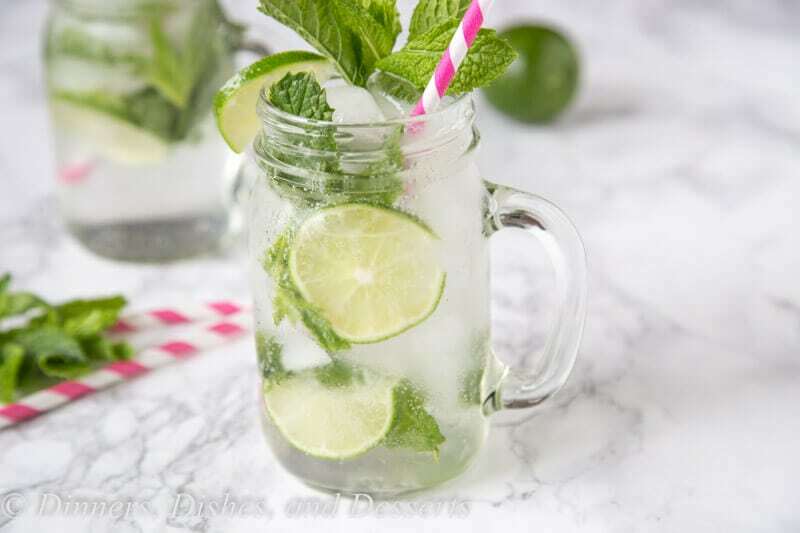 It is missing some of the elements that make up a traditional mojito, but that is ok. I took some shortcuts, used different ingredients, but you get a lot of the same flavors with a lot less calories. 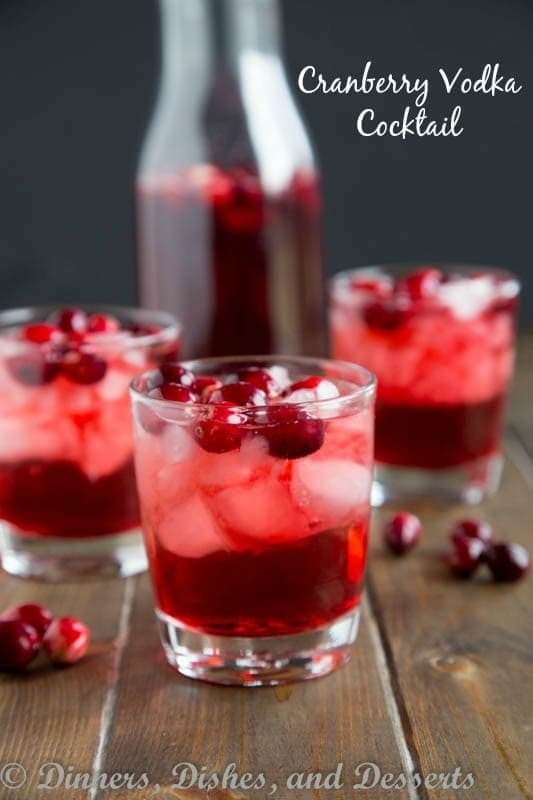 Plus if if you are sipping on them all night, they have a little less alcohol, so you can enjoy more. More is always good, right? 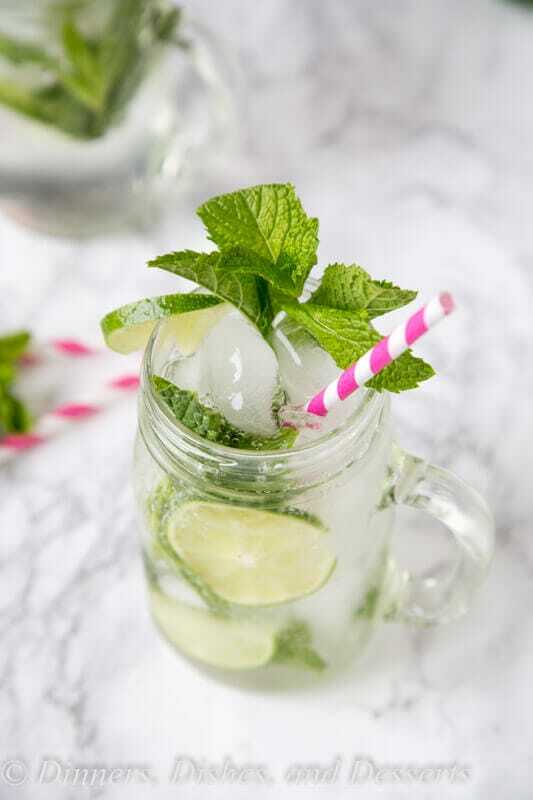 So just trust me, and switch it up and give this skinny mojito a chance! 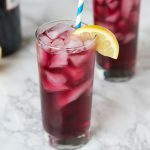 Or jump to a red wine spritzer that is just as refershing and doesn’t take any short cuts. 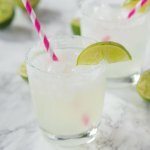 To make these skinny mojitos I used lime flavored hard seltzer water. 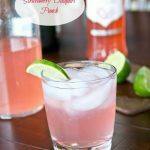 It gives just a hit of lime flavor and all the fizziness you need for the cocktail. 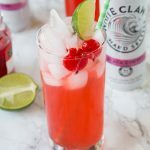 The hard seltzer takes the place of the rum and the club soda you would normally see. But no worries – you still get to muddle mint and lime together, I am not taking everything away from you! And there is simple syrup to sweetened it up. You can make your own, or use the store bought stuff, that is up to you. I like mine a little on the sweet side, but you can cut back if you don’t care for it as sweet. 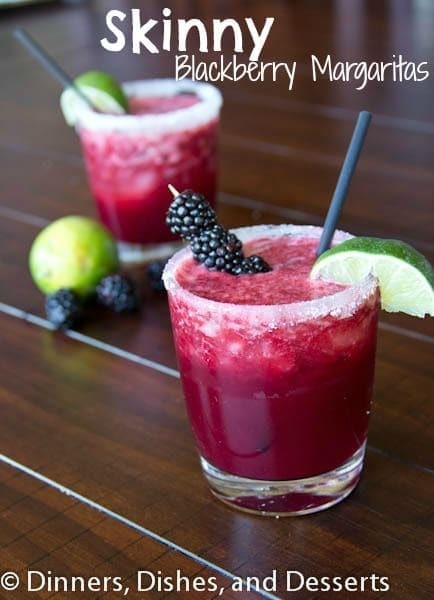 So just trust me and give these skinny mojitos a shot! Your jeans might just thank you. 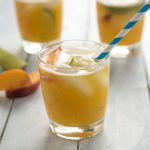 Skinny Mojitos - enjoy all the flavors of a classic mint mojito, in an easy and just a little bit healthier version. In the bottom of a tall glass squeeze juice of 1/2 of a lime. Add the lime and mint leaves, and muddle together. Fill glass with ice. 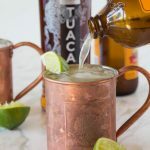 Add simple syrup, and fill to the top with lime hard seltzer. Stir gently to combine. Garnish with more mint and lime if desired. 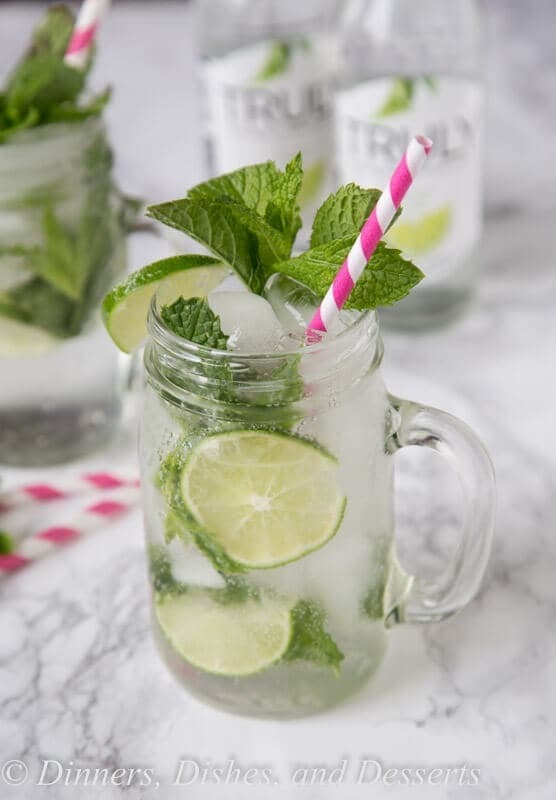 A skinny take on a mojito? Sign. Me. UP. I love the pink and green color combination! Great shots! 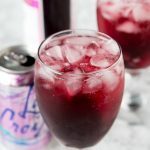 This sounds like the perfect drink for me! Yay! 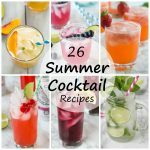 No need to miss out on a summer drink. Thanks for the healthier twist! OMG! 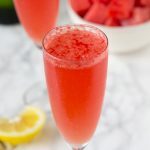 What a refreshing summer drink!! I need to give this a try! 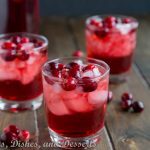 Love this skinny version – can’t wait to give it a try this weekend! Saving this for our next party!